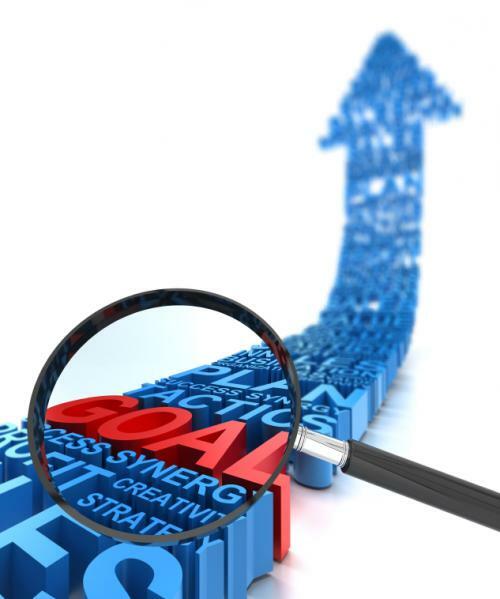 Establishing business goals requires investigating your company's capabilities and identifying where you want the company to be in terms of size, income, and capacity in the future. Setting goals and periodically reviewing those goals can help ensure that your company's growth and progress is on track. Start by considering goals that you would like to accomplish. Make a list of those you come up with, no matter how outlandish. According to the Houston Chronicle, examples of goals include those related to areas such as profit, customer service, or growth in website traffic. Other goals include increasing market share, entering new markets, developing employees, developing new product lines, or enhancing marketing efforts. Next, analyze each of the goals you wrote down according to the SMART guidelines. SMART stands for "Specific, Measurable, Attainable, Realistic, and Timely." These aspects of a goal can be used as guiding principles to identify reachable goals because they help you identify those goals that are actually obtainable, has measurable results, and can be accomplished within a specific timeframe. Who: What department or individual will be responsible for undertaking the goal's accomplishment from beginning to end? Does completing the goal require more than one department or individual's work? If so, how will those individuals work together? What and Why: What is the specific aim of the goal? This refers not only to what you want to accomplish, but also what you hope the end result of the goal will be. For example, you short-term goal may be to increase profits by a small percentage, but the reason for the goal is to reinvest in the company's infrastructure or website. Identifying the purpose of the goal can often help direct workers in performing the tasks that will help accomplish the goal and its overall purpose. When: What is the short-term timeframe for the goal completion? Not only should you identify the overall timeframe, but also the steps along the way that can or must be accomplished in a specific amount of time. One of the best ways to create goals is to obtain employee input. Gathering opinions about how to accomplish the short-term goal in terms of tasks to perform and assignments to complete can help narrow the field on what actually needs to be done and how it will help achieve the goal. A consideration in clarifying the how is the cost affiliated with the goal. Although the ultimate purpose of a goal may be to earn more profit, most goals include some cost, even if just in the form of manpower required to complete the goal's tasks. Once you have gathered information about and established the particulars of a goal, you will have a better idea of which goals you can reasonably expect to accomplish. From here, select the goals that you would like to undertake based on the ones that fit the SMART guidelines as determined by your analysis. Determining what is long-term and what is short-term will help you identify what goals to tackle first and how to undertake their accomplishment. Inc. Magazine recommends identifying long-term goals as those to be achieved within 3-5 years, and short-term goals as those to be accomplished in less than three years. However, these timeframes might not be an exact fit for your company. Depending on your company's size, the product it sells or services it provides, and its general operations, you might need to shorten or lengthen the timeframe for your short and long-term goals. How soon you'd like to see results from the goal: This refers to when you would like to have the purpose of the goal rather than the completion of the goal in effect. For example: having more cash flow is the purpose of the goal, whereas increasing profits is the goal itself. Once you've chosen the goals you'd like to pursue it's time to determine which to tackle first. Using your analysis, see which goals can be accomplished in the short timeframe you established, and those that will require a longer time to complete and, as such, must be categorized as a long-term goal. Choosing goals that your company can accomplish in a reasonable amount of time makes it more likely that those goals and their results will come to fruition. The result of this will likely be that your company continues to grow and prosper.